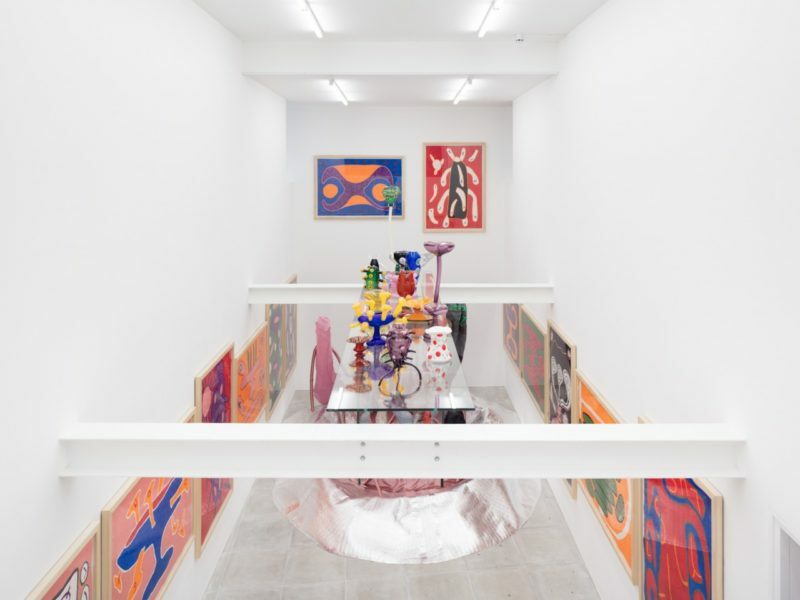 Nicholas Pope’s show at The Sunday Painter is a visual feast. 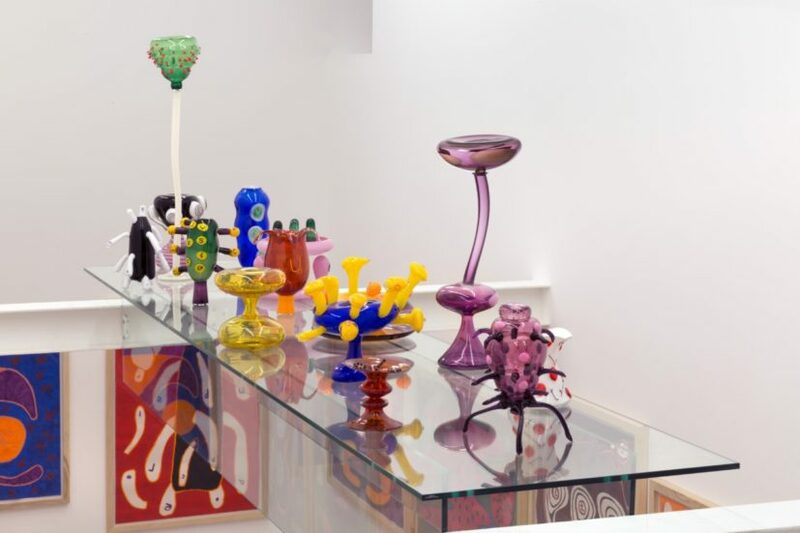 From the outside window one sees colourful blown glass pieces aligned on a glass shelf. On the back wall are two abstract paintings with anthropomorphic forms. Downstairs, drawings fill the room, creating a scenography for a large sculpture made of satin pink fabric, woollen woven parts and a ceramic piece that actually creates a two-seater sofa: a futuristic representation of a flying machine. This remarkable work, called Sofa of the Seven Deadly Sins and Coffee Table of Virtue is a piece on which Nicholas Pope has been working on since 1998, but has laid unfinished in his studio until now. During the opening Pope told me that he sat there with his wife for a photograph, perhaps symbolising the awkward and often contradictory journey of a couple. Humorous, grotesque and certainly uncanny, it defines the atmosphere of this vital and innovative show. Born in 1949, Pope has had a great career, representing the UK at the Venice Biennale in 1980 and with a track record of international group exhibitions at prestigious institutions: the Guggenheim in New York with British Art Now: An American Perspective in 1980 and at the Rijksmuseum Twenthe, in Enschede, with Simply British: Flanagan, Long, Pope in 2001; alongside shows the Tate Britain and the Hayward Gallery. The Contemporary Art Society bought Pope’s work early in his career: Drooping Column (1976) for Touchstones Rochdale, a two-metre sculpture made of wood and robe, and 2 thin stones — Mr and Mrs Arnolfini (1977) for the Walker Art Gallery in Liverpool. If Pope might seem like a rare find at first it is a momentary feeling: this is an artist that experienced curators, sophisticated collectors and knowledgeable gallerists know much about. Nicholas Pope is part of the history of British Sculpture, and thanks to the dynamic trio of The Sunday Painter he is now being rediscovered. After a serious illness contracted in Tanzania, and a long convalescence, Pope’s work acquired a so-called spiritual dimension, thinking about the meaning of life – morality as such – debating on what might be a sin and what a virtue. These concepts come back in his works and in the title of this show, ‘Sins and Virtues’. Professor Christopher Townsend, when writing about Pope’s work, mentioned how the artist “introduces doubt and belief; and ‘doubt’ through humour, humour as the vulgar mockery of those authority figures that demand ‘belief’”, an effective way of describing Pope’s complex relationship to these terms. 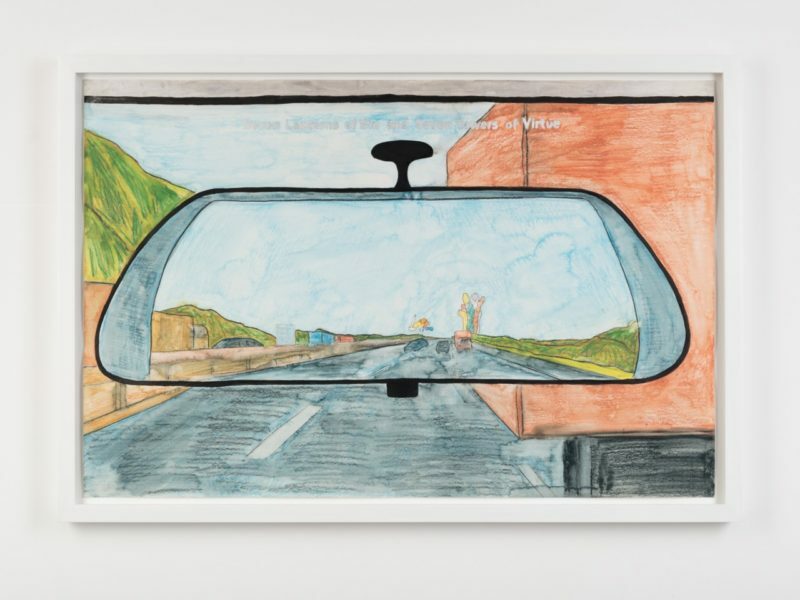 Doubt and belief, curiosity and the unknown, the abstract and the figurative, the humorous and the serious, the marginal and the modern, are all elements that coexist and merge into Pope’s oeuvre to create his precise vocabulary. Pope stepped into The Sunday Painter space in Lambeth by chance, asked a few questions, wrote down his email address and left. 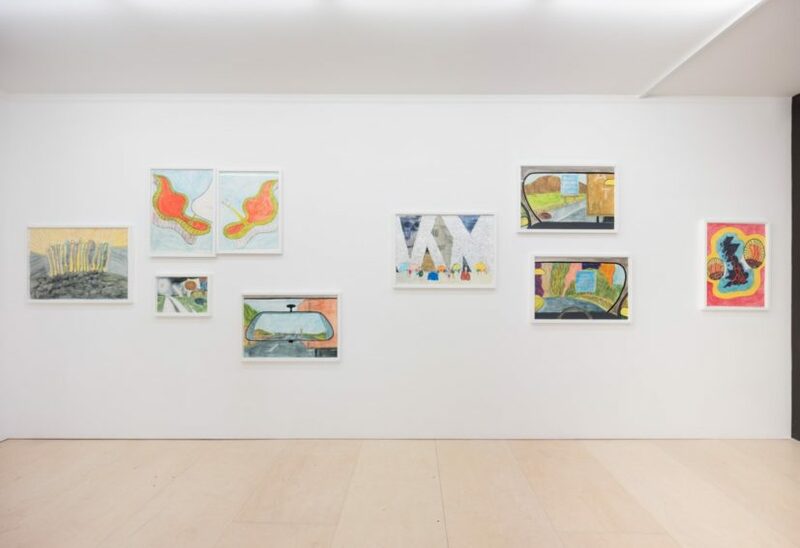 A random encounter which developed into a show, a collaboration and gallery representation. In an art world more and more dominated by “catering strategies” it is very refreshing to see choices come out of spontaneity, trust, enthusiasm and freedom. Congratulations to Pope and to The Sunday Painter on their new collaboration.